We’re excited to sponsor this September’s Vue.js conference in London, running 20th-21st. Come and join us at the SamKnows stand on the 21st — we’d love to talk to you about our upcoming projects and celebrate all things Vue! At SamKnows, we collect data that accurately reflects the quality of internet services worldwide. Vue is integral to what we do because it’s the main driving force behind our flagship, SamKnows One. SamKnows One is our cloud-based data platform that visually represents data in a digestable format. Equipped with a customisable dashboard, analytical tools, and testing-agent management suite, SamKnows One is designed for comprehensive data analysis to help monitor internet performance for an entire country, network, or home. But as with so many things in life, simplifying a complex concept such as ‘what’s going on with the internet?’ caused a rather complex site-building process — one which resulted in us using almost every major feature of Vue over nearly 80,000 lines of code! And it’s here that Vue provides us with another key advantage because, thanks to the patterns recommended by Chris Fritz’s vue-enterprise-boilerplate, adding new functionalities, without disrupting the existing code, is a breeze. 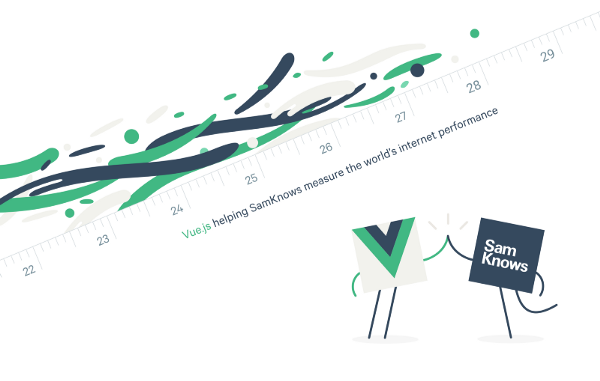 Vue also powers the front-end of almost all the websites we’ve produced over the past couple of years, from our own sites, such as SamKnows One and samknows.com, to client sites such as the Ofcom Checker and Measuring Broadband America. And if that’s not enough… we also use vue-router for routing, Vue for state management, and vue-test-utils for testing as well. We enjoy a few libraries from the Vue community, including our favourite: vue-multiselect by Damian Dulisz. We’ve also released a couple of libraries of our own, including DIRK, a Vue dashboard layout library. So come and say hello at the Here East venue in Queen Elizabeth Olympic Park on September 21st. Workshops will be running all day on September 20th which we highly recommend. Buy your tickets now!